Guardians Of Ancora Bible Plan: Ancora Kids Go Through The Roof - In this three-day Bible plan, Ancora Kids will be finding out about one of the most remarkable miracles of Jesus: forgiveness without saying sorry; healing without asking; and an extreme way of getting into a house. Along the way, there will be time to consider what this tells us about Jesus. The plan complements the free children’s game app Guardians of Ancora. Which of these actions have you done in the past two days? The man in today’s story could only do one of these things. Which one? This man couldn’t walk. Fortunately, his friends helped him out! But they chose an unusual method! They’d carried the man on a mat to the house where Jesus was teaching. They were not the first to get there: the house was already full and there was no way they could get in. They were not going to give up, though. They wanted to take their friend to Jesus and they found a way. What do you think will happen next? Don’t miss the next part of “Ancora Kids Go Through the Roof”. Pray: Move around as much as you can and thank God for all the activities that you can do. Ancora Kids! 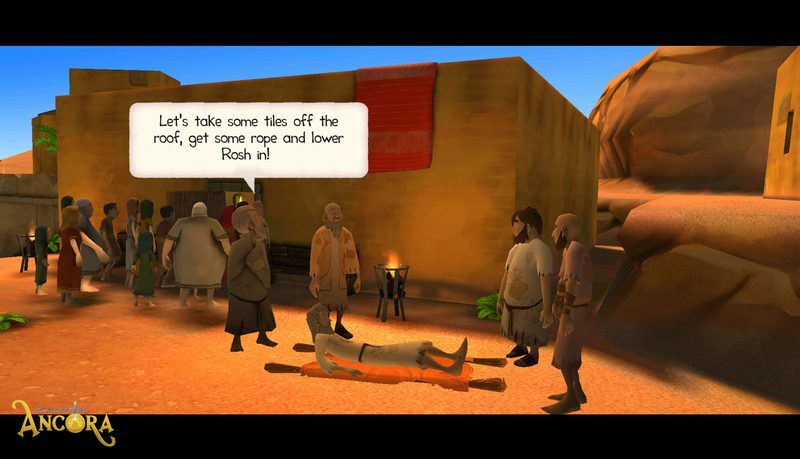 Take the Bible Quest “Jesus Forgives and Heals” in the interactive Bible app Guardians of Ancora. Download for free, from your usual app store.